For over a thousand years, El Camino de Santiago, the ancient path running from Southern France to Northern Spain has attracted countless number of pilgrims from Europe and Asia. Paulo Coelho, a Brazilian novelist wrote "The Pilgrimage" in 1987, inspired by a walk along the 800Km long path. Today, El Camino de Santiago or St. James’ Way is beaten every year by over 100,000 visitors coming from all over the world, who are searching for a spiritual healing and rejuvenation. But who would have imagined that two thousand years after St. James first walked the path, his footsteps would inspire tens of thousands of Koreans, halfway around the world, to explore their own sacred island? After 23 years of taxing days at the various newsrooms, Suh Myung-sook, then editor-in-chief of OhmyNews, a pioneering Korean citizen journalism site decided in September 2006 that she had had enough as a newswoman. After a month of preparation, she flew to Spain and started her own 36-day pilgrimage along El Camino de Santiago. Walking the trail, she met Paulo Coelho, who was then filming a documentary series about El Camino de Santiago. She also came across a British girl she remembers as 'Henney' near the end of the journey. Ms. Suh and Henney were chatting about how great it was for them to walk the ancient path one night when Henney suggested what came as a revelation to her; if the journey was so great for us, why not build our own El Camino de Santiago in the homeland when we go back? Ms. Suh recalled how beautiful and serene Jeju was when she was growing up in the island years ago. She came back to Jeju and explored “Olle,” the narrow local pathways formed by low-rising black stone walls snaking along hundreds of bucolic seaside towns. Ms. Suh realized that by restoring old paths and creating new roads for hikers to explore, she could easily build trail routes in the island that would match those in Spain. The first trail route was opened to the public in September, 2007. Since then, Ms. Suh and her Jeju Olle exploration team have created a combined total of 274km of walking trails in Jeju Island. They even enlisted soldiers training in the local marine camp to connect the seaside paths, previously broken by rocky terrain. Currently sixteen trail routes have been opened to walkers and the trail exploration team is still working on new ones. Jeju Olle has soon proved to be an instant hit among Korean hikers who’ve been looking for an alternative way to enjoy the island. In its first year, some 3,000 hikers visited Jeju to enjoy Olle trails but the number soon exploded to 30,000 in the 2nd year of the program's inception. From January to September of this year, over 200,000 hikers are believed to have walked Olle trails. Jeju has come a long way since it started its push for tourism, going through several ups and downs for the past three decades until it saw the success of Olle. In 1970s and 1980s, when Jeju was Korea’s Hawaii, Koreans would visit Jeju for their honeymoon and revisit the island a few years later to commemorate their first visit. Hopping over some well-known tourist destinations by black cab limos or tour buses was the most preferred mode of enjoying the island back then. With the exception of a few hikers or cyclists who were willing to venture out to the far corners of the island, Jeju had remained one of the many well-manicured but uninspiring tourist sites in Korea. As Korean couples increasingly started to choose oversees resorts for their honeymoon during the 1990s, Jeju has gradually lost its lure as the top destination. The rent-a-car boom compensated for the lost honeymoon traffic to a degree though, as other tourists started to drive around the island looking for some hidden wonders of Jeju. Fortunately for Ms. Suh and her Jeju Olle team, however, Jeju’s tourism industry saw another revolutionary leap in its tourism infrastructure beginning in the mid 2000s: the budget airline. On the Seoul-Jeju route, long dominated by the duopoly of Korean Air and Asiana Air, Jeju Air and other no-frills airlines started to offer much cheaper tickets. The price of a return ticket from Seoul to Jeju has dropped from as high as 200,000 won to 40,000 won (about US$40) within a year after they launched the service, crumbling the psychological barriers to Jeju for ordinary fliers. Budget airlines made them to rethink about the nature of travel to Jeju: Jeju is no more a destination for honeymoon or once-in-a-life-time trip, but a scenic island handy for a snap weekend excursion. Thanks, in part, to the blockbuster success of the Olle trails, the number of annual visitors to Jeju passed 5 million mark this October, a month ahead of the schedule, despite the growing fear over the global swine flu epidemic. And Olle is winning the hearts of Jeju natives as well. Whereas traditional tourists spent their travel budget in the big name hotels and resorts owned mostly by mainlanders, the money Olle hikers are spending is literally trickling down to the bottom of the Jeju economy. Walking along the 16 Olle trail routs, hikers can easily spot ‘welcome’ signs posted by hundreds of local mom-and-pop stores and restaurants. For the first time in the history of Jeju tourism, tourists from the mainland are being truly welcomed by the Jeju natives. The question I want to ask Ms. Suh next time I meet her; what happened to Henney, the British girl who first inspired her to start the Olle exploration three years ago? Maybe she will have to invite Henney to Jeju sometime and walk the Olle trails together. I almost accidentally visited to this site.You compose very detailed.After studying you site, your internet site is extremely useful for me .That is really amazing dear buddy keep it up. I almost accidentally visited to this site.After studying you site, your internet site is extremely useful for me .That is really amazing dear buddy keep it up. I almost accidentally visited to this site. Stayed because everything was very interesting. Surely will share with all my friends!…That is really amazing dear buddy keep it up. When the 2010 Hyundai Sonata was unveiled in Seoul early September, car mania here gasped at its bold coupe-like body line swooping down to the C-pillar. Sonata has been one of the most loved family sedans in Korea, sold primarily among drivers in their 40's. Obviously, it was a big gamble for Hyundai to shed a substantial amount of head-room from the Sonata's rear seats that have traditionally been crowded with a couple of kids. Hyundai' decision to design the new Sonata as a four-door coupe has proved to be a farsighted move before long. According to its latest sales data, Hyundai has since sold over 59,000 Sonatas, making it the biggest selling new car ever in the Korean automotive history. Market analysts agree that the unlikely success of the coupe style Sonata is due in large part to the rise of single family in Korea. Single families, the rapidly growing segment in the Korean auto market do not care much about the rear headroom any more, they note. In fact, the largest group of Sonata buyers was in their 30's, accounting for near 30 percent of the total sales volume according to the Hyundai's sales data. Other mid-size sedans, including the older Sonata models, have usually been sold more among the drivers in their 40's. What is going on here? With the shrinking job market, countless number of 20's and 30's are postponing their marriage. The share of unmarried women among the early 30's has risen from little over 10 percent in 2000 to 19 percent in 2005, pushing down the birth-rate of Korea to 8.93 births per 1000 persons, one of the lowest among the advanced economies. In addition, many Koreans are separating from their spouses, and again returning to the single family segment. The divorce rate of Korean couples was 3.0 per 1000 persons in 2002, the 2nd highest number after the United States. All told, the number of single homes has doubled from 1.64 millions in 1995 to 3.34 millions last year and the government predicts that one out of four families will be single home by 2030 if the current trends hold up. Naturally, it is not just Sonata but the entire Korean consumer industry that is grappling to catch up with the fresh buying power of the single families. Home builders, long accustomed to building ever bigger apartments as the middle income families have steadily expanded their homes to accommodate the needs of growing children, are allocating more studio apartments recently, when they design a new residential town. Consumer electronics sector is struggling as well to pander to the fickle tastes of the single families. Whereas the size of flat screen televisions only keeps growing, Samsung and LG are selling more and more small-size refrigerators and washing machines optimized for the single family. E-mart, the largest retail chain in Korea, opened Mini-Mini Zone in its Gwang-ju store last July to test the demands of single buyers. E-mart stocked the shelf mostly with single-size foods and other staples good for a single serving. After seeing that the one-meter long shelf sold over 5 million won worth of goods within just a month, E-mart introduced the Mini-Mini Zone to another store in Seoul and plans to install it whenever it opens a new store. With the explosion of single homes, Korea is going through a seismic social change that will have more fundamental implication in the future of the country. Companies and stores are busy redesigning their businesses to satisfy their growing demands. It remains to be seen, however, if the governmental policies can keep up with the rapid social changes as swiftly as demonstrated by the private sector. As an alternative, they will stepped the particular roadways regarding town center Portland hovering to the breeze, compacted snow biting http://www.jordanretro3shoes.co.uk their particular confronts, without even wintertime shoes individual foot. I always knew that multiplex theaters have long had a special relationship with credit card companies in Korea. What I didn't know is that theater goers need to look up a giant index map plastered on the box office to navigate the labyrinth of perks and benefits permitted to them by card companies. Hundreds of credit card companies and local wireless carriers now provide their loyal customers with free movies or discounts at local theaters, ticket vendors often have to flip through a thick index book before they can issue a ticket. Welcome to the land of "freeconomics" that is Korea, where people pay points, miles and "eyeballs" -- instead of cash -- and answer survey questions to get almost anything in the market. If you've paid a full price for movies, musicals or concerts here, chances are you are either a foreign visitor or your credit card has been suspended recently. Bonus points, air miles, rewards and other various perks have been favorite promotional tools for many credit card companies the world over in attracting new customers, but its use -- or overuse for that matter -- has never been this pervasive anywhere. Ask anyone you meet in the streets of Seoul to show you his or her wallet, you will probably find in them at least 10 different cards, each strung with distinct benefits promised by the partners. "US card companies usually pay back about 1 percent of sales amount as bonus points whenever their customers shop in the affiliated stores," an executive of Korean credit loan association says. "Not a tiny rate for sure, but the actual points paid back to the customers is much smaller than in Korea due to the limited number of partnered brands." Korean credit cards are usually affiliated with more than 10 local brands per card, making it much easier for the companies to offer free gifts, discounts and other co-promotion deals. American cards, on the contrary, have at most two or three partners on offer and are mostly focused on providing air miles or fuel discounts at gas stations. The flip side of this crazy Korean freeconomics fueled by credit cards is that customers are in reality narrowing their shopping options in the market, in return for these perks and freebies. Think of the famed channel management strategy of Wal-Mart, shrank to the level of an individual consumer. Wal-Mart is notorious for wringing out heavy concessions from its suppliers -- that is how they can offer bargain prices to shoppers. The selected suppliers, however, are given exclusive rights to fill in thousands of miles of Wal-Mart stalls around the world. In the case of Korean credit card holders, they are narrowing their shopping options within a few partnered brands, hence increasing their life-time values to them. There is no free lunch; you bought a freeconomics from card companies by giving up your other buying options. Giving up your other buying options would not be much of an issue as long as what you get from the affiliated partners has no tangible difference in the benefits you can find elsewhere; however if that decision interferes with your eating habits, it is no more an issue of simple choice. Local card companies have partnered with scores of restaurant brands; the problem is they are mostly American fast food chains or family restaurants that feature a variety of greasy junk foods. If so, narrowing your dining options to those partnered brands for too long could potentially pose a grave threat to your health. In the country where the extensive broadband infrastructure has practically decimated the paid content business, persuading the fans to pay for ephemeral products is increasingly becoming a losing game for the music industry. JYP, the local music label that has successfully launched Rain, the international K-Pop sensation, grossed 7.5 billion won or some US$6 million in 2008 by producing three blockbuster hits with Wonder Girls, its five-member girl group. Still, JYP recorded a 1 billion won loss, despite the brisk sales in music CD's, MP3 files and ring tones. JYP could cap its loss though by closing a series of advertising deals worth over 1.5 billion won with Korean sponsors. Here we see the emergence of free content distribution model subsidized by advertising dollars. LG has practically bought out a new song by Big Bang, a Korean boy group recently, when it used the song in the television commercials well before its official release, for the newly launched Lollipop line of mobile phones targeted at teens. The new kind of freecomocis was realized again, but for every Lollipop phone they subscribe for, boys and girls are paying for the Big Bang's new hit song indirectly in the form of eyeballs or monthly phone bills. When a new gadget seems just too expensive to attract but a few excited early adopters, tech companies usually turn to a variant of freeconomics called "servicification." That is exactly what Thinkware and other local car navigation system producers are hurrying to establish before they launch Wibro navigation terminals to the domestic market. Once a car navigation terminal is sold to customers, the relationship between the vendor and drivers is limited to a few periodic software upgrades that happens once in a while. Thinkware hopes to change that by giving away Wibro navigation terminal "for free" and charge monthly navigation service fee instead. Wibro is the service brand of KT's Wimax wireless broadband network, and coupled with the car navigation system, it promises to offer a suite of advanced traffic information solutions updated real time, thanks to its permanent connection to the broadband Internet. Before long, Wibro terminals in the dashboard could relay real time driving data fed from ECU to the servers of auto companies, turning your car to a giant mobile handset on the highway. The servicification of automobiles will not stop at the navigation terminal. Expect Hyundai to be transformed to a Web 2.0 service carrier on the highway soon. All these examples illustrated here point to one direction; the freeconomics is not a free lunch given to you for no reason. It is a barter economy disguised as free movies, air miles, or sometimes shiny new gadgets, that attempts to turn every B2C transaction to B2B's. You thought you enjoyed a hot new Hollywood flick for free? You will pay for it when you watch new ads, shop for new pants or eat your burgers. i am really delighted by seeing such nice article posted here..
Have a fear of flying? Korean researchers may have an answer for those suffer from aerophobia -- at least travelers to Jeju, Korea’s Hawaii and the favorite destination for local honeymooners. The current solution for those with a fear of flying is to go to Mokpo by KTX bullet train then change to a ferry boat that sails to Jeju in 4 hours. Korea Transport Institute, a government think-tank proposed an ambitious plan early January to extend KTX bullet train to Jeju, the largest island in Korea. To realize this grand vision, the institute says, it will need to build the longest underwater tunnel ever built in human history. Two small islands-Bogildo and Chujado-located between the Peninsula and Jeju will provide convenient stepping stones for the Korean rail builder that will dig this grand underwater tunnel. The institute says the constructor will first need to build a 28Km-long over-sea bridge connecting Haenam and Bogildo. 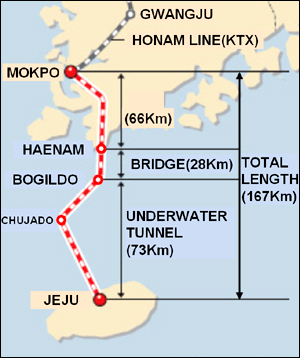 The rest of the line will be completed by digging a 78Km long underwater tunnel down to Jeju using Chujado as a main drilling station. If completed, Mokpo, the current terminal of Honam KTX line will be reborn as a departing station for the extended rail section, which will host the longest underwater railway tunnel. The current record holder is Japan's Seikan Tunnel (53.85Km) which crosses Tsugaru Strait, followed by Channel Tunnel (50.45Km). The Institute stresses that it will enhance the overall economy of the existing Honam Line since the KTX bullet trains will attract near 78 percent of air travelers to Jeju. Some 8.4 million travelers visited Jeju in 2007 and they traveled mostly by air according to the Institute. Journey time from Seoul to Jeju by KTX bullet trains will be 2 hours 26 minutes, about an hour longer than the air travel. However, if you count in the time required for passenger check in, security check and heavy city traffic to local airports, the institute is convinced, KTX trains will compete fairly well with airlines. If new and improved KTX trains are going to run between Seoul and Jeju, the journey time will be slashed even more. The commercial cruising speed for KTX bullet trains remains around 300Km per hour currently. The new Korean bullet trains poised to replace current KTX train sets beginning 2013 will cruise at 350Km/h, with its top speed reaching up to 400Km/h. While many train lovers in Korea are fondly dreaming about a fantastic underwater train ride to Jeju, one bad news coming out of the train tracks glooms the prospect of Korean bullet trains. Government auditors discovered this week potentially crippling cracks in the concrete sleeper ties installed in the extended track between Daegu and Pusan, which is currently under construction. A total of 150,000 sleeper ties will have to be replaced with an estimated cost of over 100 billion won or about $71 million. Better safe than sorry though for over 100,000 daily KTX riders. As the governments around the world are struggling to weather the severe financial crisis by investing heavily on building grand national infrastructure, the underwater bullet trains will at least give the Korean government a much needed excuse to inject big pile of cash to its pet project--about $10 billions in this case. The sneakers present an in crafted heel plug that moulds to your athletes rearfoot when uou have concluded a pair of runs and serves to secure the rearfoot squarely in the trainer, subsequently delivering outstanding service and enjoyment as there's less tendency for your precise rearfoot to wiggle all around every time instruction. who may have stated in by way of a few Carmín winters donning simply shoes in the basic legs, almost all Xero Shoes buyers wished http://www.2pradahandbag.co.uk some sort of part of heat involving their very own legs plus the aspects. "Captain Abrams, I Was Not Emotionally Compromised"
Just come back from the "Star Trek" world premiere in Seoul. Feels quite earthly and industrial for a space flick but not compelling enough to revive the famed space opera franchise. The fast-paced movie did not allow viewers a single moment to savor the grandeur and serenity of space. I guess so called "rave reviews" are mostly coming from the hard-core Trekkies. To me, 2 out of 4 stars. Captain Abrams, you've squeezed in just too much audio-visual extravaganzas to put me "emotionally compromised." And since when Hollywood premiered its big time summer flicks elsewhere but U.S.? Perhaps studios noted the online buzz machine in the bandwidth capital of the world is much louder and conducive to earning free publicity. Or they simply aim to preempt rampant Asian file downloaders by opening them in Seoul first. In any case, Seoul's movie fans are winning. olCoach Outlet Store is in part simply a response to consumer demand. Consumers accept the notion of the desirability of select consumer product brands and designer labels. Yesterday, I saw an advertisement of lady's handbags on Coach Outlets Online. I was obsessed by the unique decorative pattern and special appearance of coach outlet store online. Chateaus and castles, aged estates of the privileged few have been constantly turned into luxury hotels in Europe throughout the 20th century, attracting tourists who hope to relive the nights of past opulence and glory. So popular the trend, a plan by Salzburg city to run a hotel out of a former home of the von Trapp family immortalized in the movie "The Sound of Music" even triggered fierce resistance of neighbors. Compared to the precedents of European hospitality sector, commercial exploitation of hanok, Korean traditional house has been relatively a non issue in Korea. As cheap won draws tens of thousands of tourists to Seoul and other major cities recently, hanok has finally shattered long indifference of Koreans and starts to gain a renewed interest among travelers home and abroad. From a simple hanok home in Samcheong-dong redesigned as a wine bistro to a five-star hotel, commercial development of hanok is in a full swing that the price of a mediocre hanok home can easily fetch for a double and even triple the price as compared to a few years ago. The modern-day rediscovery of potential commercial value in hanok was pioneered by Jeonju, the culinary capital of Korea famous for bibimbap (mixed rice and vegetables) and the birthplace of Yi Dynasty of Chosun. Jeonju city officials have been brainstorming since early 2000 over some candidates other than bibimbap that would enhance tourist attraction of the city, when they turned their attention to nearly 700 hanok homes preserved by the presidential order but left alone for several decades, languishing in the strict restriction of economic activity within the district. Jeonju first built a couple of model hanoks that would showcase the city's architectural heritage and traditional ways of life. It then subsidized renovation of scores of existing hanok homes owned by local residents. Its most popular project among tourists, however, was a hanok hostel that opened before the 2002 World Cup, where tourists can experience the authentic traditional life of Koreans complete with a Korean breakfast. Jeonju's hanok experiment has soon spawned various copycat projects by other local governments. The culmination of the hanok renaissance, however, can be found at Ragung, a five star Hanok resort hotel in Gyeongju. Roughly translated as the Palace of Shilla, Ragung attempts to recreate luxurious ambience of hanok residence from Shilla dynasty where kings and elites would call their home, but without sacrificing modern-day amenities that today's hotel guests with discerned taste would expect from a five-star estate. Ragung has recently enjoyed a renewed publicity after "Boys over Flowers," a hit Korean drama was filmed here. Another breakthrough made by Ragung's designer was that its builders used modular wood beams, bricks and other ornaments as opposed to conventional practices by traditional carpenters who rely on components custom-made for each new hanok. The standardization of hanok building invited criticism from some purists though but this innovation greatly improved efficiency of construction process and reduced total man-hours, helping to spread the hanok fever among layman hanok fans. It might be too premature to worry but Ragung's innovations could signal that hanok would not be considered a rare experience some day in the near future if the current buzz about hanok spreads at this rate. Until then, enjoy this unique Korean hospitality if cheap won starts to whet your appetite for travels to Korea. for a while now! Thank you! The jordan retro shoes has been created by innovative design duo Hellicar & Lewis and is inspired by jordan shoes – a work owned by Tate. As with The Passing Winter, in order to experience the work, the audience peer into jordans retro 13 to view a dancing display of colour, movement and light. The jordan shoes sale in that it has been created to react to both social media and physical activity. For example, tweeting “jordan retro 1 next red sparkles” sets off Nike Air Jordan Retro 2 in the cube and sends a twitpic of the display to the person who tweeted the http://www.jordanretroshoessale.com/. Walk the streets of Myungdong, the famous shopping district in Seoul this winter. There are hundreds of Japanese tourists peering in show windows of fashion boutiques holding piles of shopping bags, Korean sales staff hawking them in perfect Japanese, top Korean restaurants overflowing with Japanese cuisine hunters turning away their loyal Korean customers... You would have been almost transported to middle of Shinjuku, Tokyo. Seoul has always been a favorite destination for Japanese leisure travelers hunting for a handy weekend trip but cheap Korean won is drawing Japanese visitors in droves to Seoul this winter. Korean won has dropped to 1,600 won per one 100 yen recently, about 50 percent cheaper than a year ago. Won has unanimously depreciated against US dollar and other major currencies in the wake of global financial crisis but the drop was particularly dramatic against Japanese Yen. Local stores have begun to see the immediate effect. Lotte Department Store, the top shopping destination for Japanese visitors has reported 12-fold increase in January sales among Japanese shoppers. Its main store in Myungdong alone sold goods to Japanese worth over 9.1 billion won, about 7 percent of its entire revenue. They mostly shopped for luxury fashion brands, cosmetics and Korean traditional food items. Shinsegye, another department store in Myungdong reported that 6.3 percent of its January sales has been made from Japanese. Lotte hired more translators to help uneasy Japanese shoppers and even broadcasted public announcement recorded in Japanese language. Some Japanese shoppers are reportedly making multiple trips to Seoul after realizing that air ticket cost can be easily cancelled out if they buy a couple of big ticket luxury items. A typical Louis Vuitton bag would be cheaper by 50 percent in Seoul after counting in exchange rate. Top Seoul hotels are almost completely occupied by Japanese visitors as well. Lotte Hotel saw its Japanese occupancy rate hovering around 60 percent for the past three months and more upscale Westin Chosun Hotel also increased the ratio of Japanese guests from 20 percent in late last year to 40 percent in February. Hotels are worried though that near 90 percent of current occupancy rate can drop any time when Japanese visitors begin to see no cheap won any more. Without a constant influx of business travelers, their main revenue contributors, Seoul hotels are vulnerable to the pesky rate fluctuation. Business travelers shuttling between Seoul and Tokyo are also struggling recently to book any air ticket they can find. Flights for Incheon-Narita and Gimpo-Haneda routes, one of the busiest already in Asia are completely booked this winter due to ever increasing visitors from Japan. For cash strapped Korean retailers and hotels in Seoul though, hundreds of Japanese tourists walking out of Incheon and Gimpo International Airports seem to be the only bonanza. The Han River, a majestic body of dark-grey water that swerves through the South Korean capital is the first sight that greets visitors to Seoul, as it did Yi Sung-gye, the founding father of Chosun Dynasty 615 years ago. Oh Se-hoon, the mayor of Seoul, felt though that the Han River lacks one critical element -- a landmark that would grace the home of 10 million Koreans, and hopefully match Sydney Opera House in its soaring scale and photogenic appeal. The Han River Art Island is mayor Oh's answer to improve Seoul's face to Sydney caliber. Nodul Island, a long-deserted islet planted in the middle of the river, frequented only by some occasional amateur tennis players, will be reborn as a giant art complex after a 450 billion won (US$300 million) cosmetic surgery. The Island will house two concert halls and art gallery after the redesign. However its most prominent feature will be the 1,785-seat opera house. Not that Seoul lacks a world class opera house either -- hundreds of operas and top musicals have been performed every year in another opera house built in southern Seoul 13 years ago. One compelling reason to build another opera house at the Han River, according to Seoul city officials, is that it will be the first water-front opera house Seoul will have -- just like Sydney. The Island can be currently reached by land via a bridge but after the renovation opera fans and tourists will also be able to choose from river boats and speed boats to get there. Complete with a ferry terminal and new foot bridge, Seoul officials hope that the new opera house will be remembered as the jewel of the Han River once completed. Since the current steel bridge that connects Nodul Island to both sides of the river would not be wide enough to handle increased foot traffic, Seoul metropolitan government plans to expand sidewalks and build a 550-meter-long pedestrian overpass from north as well as elevators on the river banks. Architect Park Sung-hong who designed the Island says he tried to visualize a traditional Korean dancer with four giant wings that sweep over concert halls and galleries. Thus his design project was dubbed "Dance. French architect Jean Nouvel was initially commissioned to design the Island after he won the international design competition but Seoul awarded the commission to Park after it decided it could not swallow Nouvel's world-class design fee. There will be one remarkable difference between Sydney Opera House and its younger sister in Seoul -- Sydney took nearly three decades to build its opera house from inception to completion but Seoul will finish the Island by 2014, just shy of five years. Now this is the one landmark achievement the Island will be remembered the world over even if it ever fails to impress international tourists with its aesthetic appeal. Great stuff from you. Ive read your stuff before and youre just too awesome. I love what youve got here, love what youre saying and the way you say it. Hi everyone, it's my first pay a quick visit at this site, and paragraph is in fact fruitful in support of me, keep up posting such content.